On Saturday afternoon Richard and AndyG went up to the Lakes in the hope of some autumn sunshine. 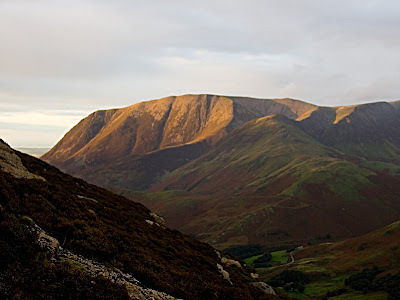 After obtaining permission to park at the Borrowdale Hotel, they set out to bag a few classics on Shepherds Crag since Richard hadn't been there before. Unusually, there was no queue below Little Chamonix, however when they got to the tree covered terrace there was a queue of three parties awaiting the final pitches. At this point Richard got brave and decided that for his first extreme lead he might like to attempt The Bludgeon E1 5b 2* because it would be a rather cool way to jump the queue. He reached the pinnacle in good style but then came the good bit. Surmounting the pinnacle with difficulty he was faced with the final few feet of overhanging rock leading to the Belvedere. Finding the key foothold proved strenuous as expected and Richard needed a rest on a cam before he was able to suss out the required sequence and finish the job. After that they were both a little fatigued and decided that dinner would be a good idea. Richard drove to the club hut and then they walked over to the Coledale Inn for a few pints and some grub. During dinner it started raining and it persisted through most of the night. 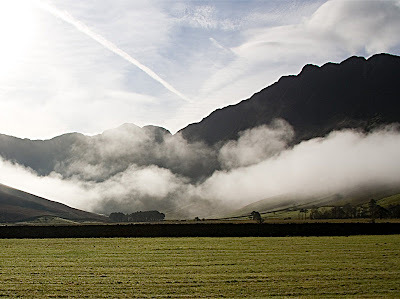 However, the morning turned out fine and the mist lent itself to some spectacular photography. After parking at Gatesgarth, they set out past the head of the lake and across the steep hillside to Birkness Combe. 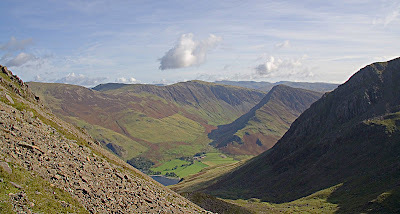 Apart from having great views over Buttermere and across Fleetwith Pike to Dalehead, the combe is home to Grey Crag. Starting at the lowest point with Harrow Buttress, AndyG led the first pitch of Spider Wall 40m MVS 1*, giving Richard the second pitch with the slightly awkward mantel onto the bracket. This was followed by Fortiter 38m MVS 1* on Chockstone Buttress. 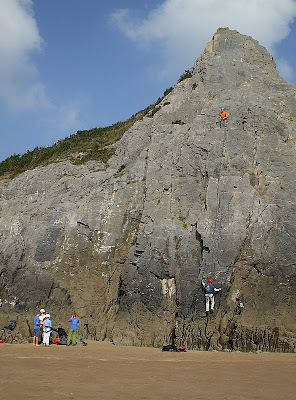 Finally moving up to Oxford and Cambridge Buttress it was Richard's turn to lead Dexter Wall 42m VS (4a,4c) 3*. Described in the guide book as the crowning classic of the crag, it was a fine climb to end the day on. Richard and AndyG were soon safely back in the car park not realising that just a mile or two away their friends were still battling with the Miners' Girdle. Following their attendance on the trip to Burbage the previous weekend, Debs and Neil very kindly invited your intrepid News Editor to sample the delights of seaside climbing on The Gower in South Wales, together with some of their friends from Hangin' On (The outdoor club that's not a club). After a long drive down from Warrington we arrived, after dark, at a busy campsite with no sign of their friends. After a flurry of texts and mobile phone calls it was established that they were on their way but had been delayed by traffic. Next morning we eventually awoke to bright sunshine and blue skies. After a leisurely breakfast and packing of equipment we set off to find the beach. 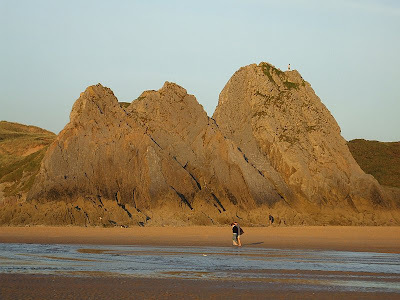 The crags at Three Cliffs Bay are only accessible for about three hours either side of low tide so we had some time to kill and a game of cricket ensued. 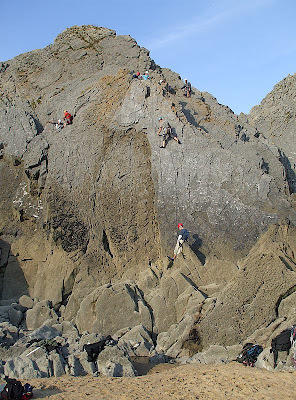 At last the tide retreated far enough and we rushed over to see what the crag had to offer. The classic route is Scavenger VS 4c 3* which goes up the slabby corner to the right of the arch. We also enjoyed Arch Slab VS 4c 2* which starts up the left hand side but then crosses rightwards to the apex of the arch before going directly up the slab to the top. 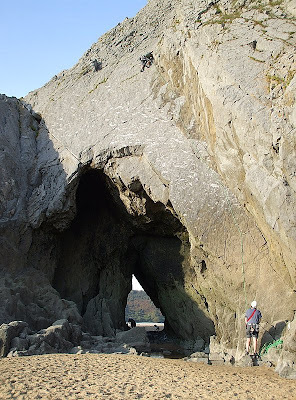 Opinion was divided however, regarding the merits of Under Milkwood VS 4b which ascends a slab inside the archway but then exits by a narrow squeeze through a blow hole. Another route worthy of note is Inverted Vee HVS 4c 1*. There is also a good selection of easier climbs ranging from Moderate to Hard Severe. Anyway, time passes quickly when you are having fun and it was soon time to leave before the tide returned and it got dark. Besides there was food to be eaten, drink to be drunk, cards to be played and forfeits to be avoided. Another leisurely start after a cold clear night. Tents and equipment had to be dried and packed away after the heavy dew fall. There was much debate and searching of the guide book to find a suitable venue because the tide was going to be well in for much of the morning. Eventually a decision was made and we set off to find Little Tor. It wasn't straight forward, either to get parked or to find the right crag but we persevered. 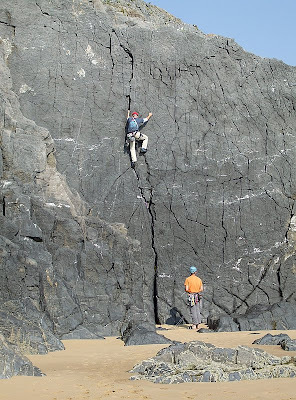 The route of the crag is undoubtedly Central Flake HS 4a. 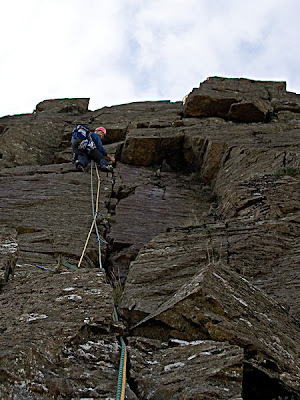 This climbs the front of the large flake which lies aginst the front of the crag and the route can be extended right to the summit for best effect. There are a good number of other routes graded from Difficult to HVS on the smaller walls to either side of the Central Flake area. Time passed pleasantly in the sunshine. Your editor even got to go and fly his kite over the wide expanse of clean soft sand recently exposed by he retreating tide. Unfortunately it was soon time to leave and start the journey back up north. 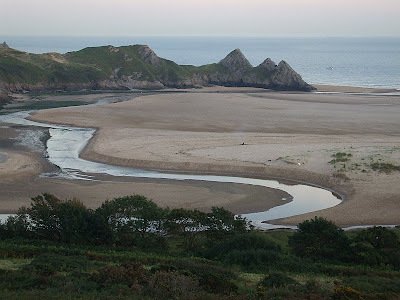 However, it was a very enjoyable trip and has just whetted my appetite to return and explore some more of the wonderful scenery in The Gower. Finally, thanks again to Debs and Neil in particular, for inviting me, and to all the Hangin' On crew(Mick, Scott, Jo, Louisa, Graham and Lyndon) for making me welcome. Sheila thought this article on the BMC website might be of interest to members. It concerns a survey being conducted by the Peak District National Park Authority into recreational use of the park. 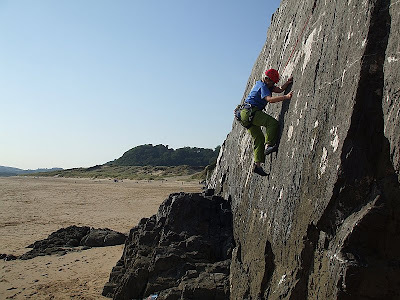 JeffB and AndyC have been at it again, someone should remind them that climbing is so much more pleasant when the weather is warm and dry. Anyway, here is JeffB's report with photos from AndyC. CASTELL HELEN, SOUTH STACK GOGARTH. Tuesday 16th of September saw Andy C and Jeff B driving to Hollyhead in the pouring rain, trying hard to be optimistic about our prospects of climbing something at Gogarth. Sitting in the cafe at South Stack over a second cup of tea, the rain had stopped and although there was no wind to help dry the rock we felt it was worth having a look-see. Geared up on the car park (as you do) and it was off to the abseil point just below the old lookout. Things looked really damp, so we prudently decided to ab to the halfway ledge and see how things looked from there before committing to a full 60 meter rappel down into the niche. From the ledge you can access the top pitches of RAP and PEL (both VS). As the rock was so wet though, we(Andy) found a cunning line using sections of both routes and making the most of any dry rock he could find. That said, he still managed to stay true to the correct line of RAP on the final wall which is steep and was absolutely soaked. Goes at 4b too. Nice one Andy. Thus encouraged we felt more than happy to use our in-stitu ab rope to get ourselves down to near sea level and into the little niche from which we could make an assault on POSIEDON VS 1* ( 4b, 4c, 4a). Jeff led the first pitch finding the climbing pretty straightforward and the positions ever improving as height was gained. Belaying from a comfy ledge I brought up a happy Andy who led through on pitch two announcing it to be even better than the first. The climbing being a bit harder and the exposure a bit more......er.....exposed. Smashing. The top pitch is really a bit of a scramble (it's the last bit of Lighthouse Arete) but we were quite happy to follow this line rather than try the direct finish which goes at HVS as this follows a shallow groove which was soaking wet. My writing is not doing ths climb justice, it really is a belter and highly recommended. 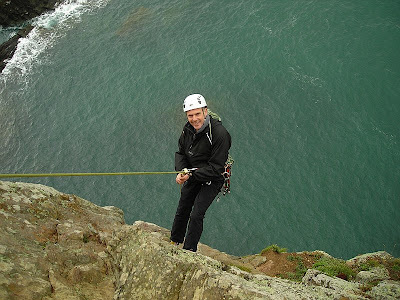 So, back at the abseil point, a handful of nuts and a swig of water.........what next.....? BLANCO 2** HVS (4c, 5a, 4a). There followed a few ups and a few downs and a few left moves and a few fight moves and one large handful of rock which detatched itself as I was pulling on it and an eventual bee line to sanctuary, running out of quickdraws and panting and shaking and a glance down at Andy's rueful grin told me that I didn't need to get the guidebook out to know that I was way off line. Bugger, no tick for Blanco then. Following a request from a new prospective member and interest expressed by several others a special trip to Burbage was arranged for Sunday 14th September 2008. Although there were a few latecomers, most people met at 9:30am at the Burbidge Bridge car park. Several beginners and prospective members attended including Rebecca, Paul, Alison, Fiona, Anne and her daughter, and also Debs and Neil. 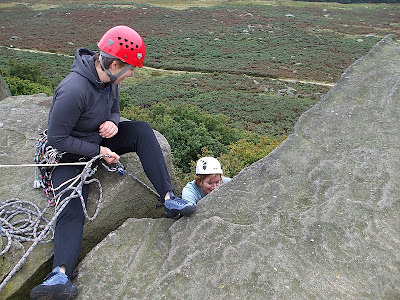 A wide variety of routes were attempted, although the focus was on giving the beginners a gentle introduction to the art of gritstone friction climbing. The video shows Neil(a prospective member but actually very experienced) top roping Black Slab (VS 4b 1* 8m) belayed by Paul and supervised by DaveC. 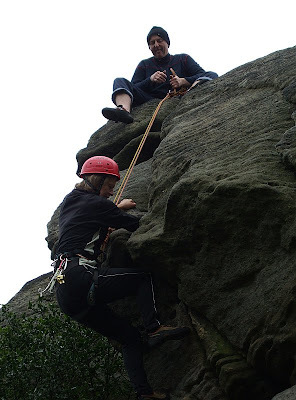 However, after that gentle introduction, DaveC seemed determined to inflict a little bit of gritstone thuggery on some of our slightly more experienced beginners. Hence the photo above and also this video of Alison top-roping The Grazer (VS 4c 1* 8m). Other routes climbed included Monkey Wall (Mod 8m), Monkey Corner (VDiff 1* 8m), 20 Foot Crack (Severe 4b 1* 6.15m), Sentinel Crack (Diff 10m), End Slab (Mod 8m) and End Buttress (Mod 8m). The weather was dry and warm enough although slightly overcast. Everyone had a very enjoyable day, although it was slightly more strenuous for some than others, and there was no dissent when DaveC suggested that we all retire to the Yorkshire Bridge Inn near Bamford for a well deserved pint, or three, on the way home. Top-ropes and assorted gear was provided by MarkD, DaveC and AndyG amongst others. Thanks is also due to all the other members(including even the exceptionally elusive TrevorS) who turned out to make the beginners and prospective members welcome. 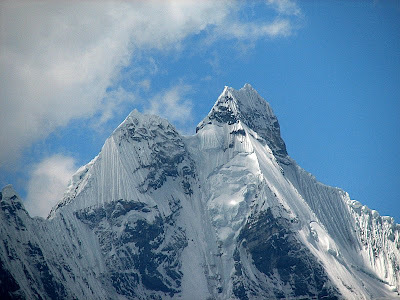 This compact area of spectacular mountains, south of the Cordillera Blanca, has become better known because of the book and subsequent film, Touching The Void, the story of the epic first ascent of Siula Grande’s west face by Joe Simpson and Simon Yates in 1985, concluded by the former’s escape from what would have been an icy tomb. The mountains are encircled by what must be one of the world’s best trekking routes – 160km, including 8 passes, over 12 days, camping at altitudes of 4000 to 4500m, and walking up to 5000m. For good measure a climb up Diablo Mudo, 5350m, was included. 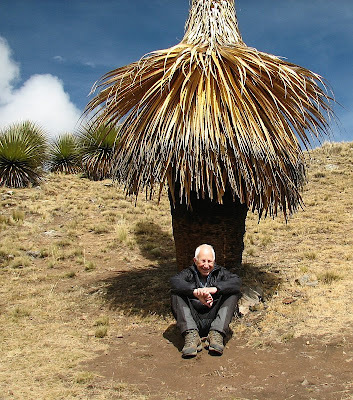 My ambition was to test my reaction, after a gap of 40 years, to altitude and subsequently consider climbing higher, perhaps in the Andes or in Asia. Coping with the altitude at my own pace was OK but I’ve discovered that, unless I can improve my aerobic ability significantly, this ambition has now been nipped in the bud. The trek was “fully supported”, that is our group of 5 carried day sacks only, all food, tents, cooking and other equipment being carried by 20 burros (donkeys). We had a local guide who spoke good English, a cook, assistant cook (who was also assistant guide) and 4 donkey drivers who also performed lots of camp chores. They were incredibly fit, running with the burros. We were also accompanied by a horse, for emergency evacuation or in the event that we weren’t feeling well; all of us had to take advantage of a ride, either due to altitude sickness or we had picked up bacteria (even trying to observe good personal hygiene), perhaps from dishes rinsed in streams. 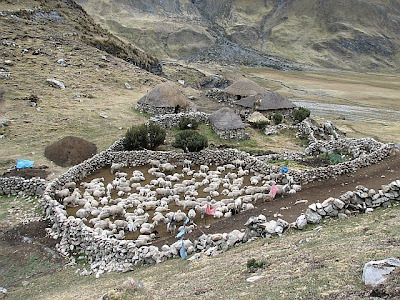 Apart from the burros, horses and mules supporting visitors, the local people keep sheep and cattle, and one thing that they all produce in abundance is dung, which not only nurtures the soil but is a ready source of bacteria for the streams. I must also mention the (small) toilet tent, which is de rigueur, erected on each campsite by each visitor group. The toilet was a hole in the ground and its use required dexterity. I won’t go into further details of construction and use, but we decided that it was not an approved subject for discussion at meal times. 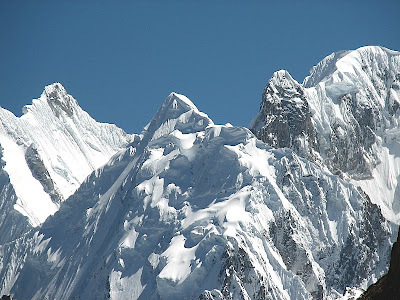 The campsites were generally in spectacular situations, by lakes or in valleys with views of serrated peaks whose heights were between 5500 and 6617m (up to 21700ft), with tumbling glaciers and several with unclimbed faces of very steep ice. There were also rock faces, some of questionable quality rock, others of sharp almost black limestone slabs that would shred your hands if climbing was attempted. The first few days were cloudy but later the skies cleared and then temperatures at night dropped, the lowest being -10C. We had the odd snow flurry but overall it was dry. The paths were well-defined, angles varying, sometimes steep, sometimes very dusty or mashed into mud by donkey hoofs, in places with boulders or rocky, generally with little scrambling involved. There were few trees, hillsides being grassy (some with wild flowers), covered in scree or entirely rocky. Compared with camping that requires back-packing, this was luxury camping. Initially one welcomes food that is brought to the dining tent but after almost a fortnight, hallucinations crept in of favourite dishes at home, and one became increasingly critical of what was cooked, perhaps unfairly so at times. Our last meal was interesting. 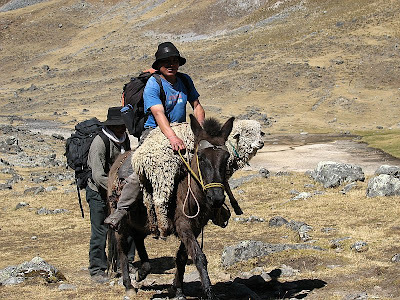 A sheep was purchased from a shepherd en route over a pass, slung protesting over the saddle of an accompanying mule (see photo above), killed at camp, cut up, and cooked in a “pacha manca”. 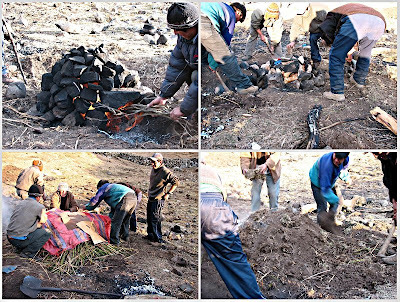 This is a hollow stone pile heated by burning wood, collapsed, and mutton, potatoes and yams wrapped in paper or carton placed on the hot stones, and covered in green grass, cloth and earth for an hour. The mutton remained toughish but tasted good, as did the potatoes and yams, and we accompanied this with wine, which we had drunk only occasionally and very sparingly during the trek. 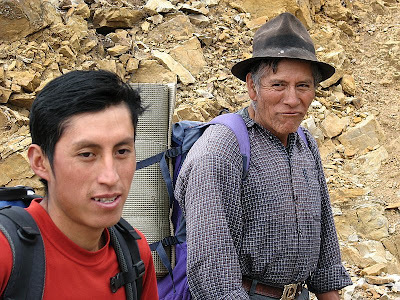 The company that organised this trip was Andean Trails in Edinburgh. 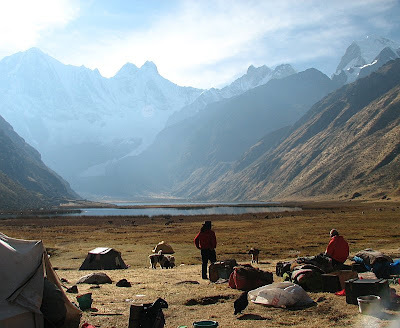 They have a local Brit (independent) based in Huaraz who makes all the local arrangements for transport, camping equipment, any hire of climbing equipment, personnel and animals. 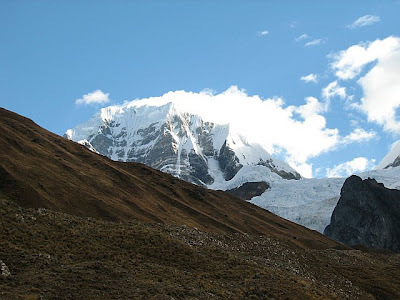 After arriving in Lima one has an 8-hour bus journey to Huaraz, a town of 120000 people that is the base for the Cordillera Blanca, Huayhuash and other areas. 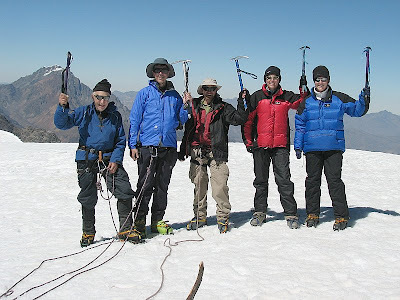 If you want experience of being in wonderful mountains this is an area I can recommend, and if you want snow and ice climbing on 6000m peaks there’s lots of opportunities in the Blanca and Huayhuash ranges, with up-to-date guide books available. Ste: "Excuse me, can you tell us how to get to North Stack please?" Old Lady: "Oh yes... You go back down here, then turn left, then you take the next......................."
And off you go to ask in the Post Office and buy a Mars Bar. Found North Stack eventually where Graham and Dave were waiting patiently at the car park. 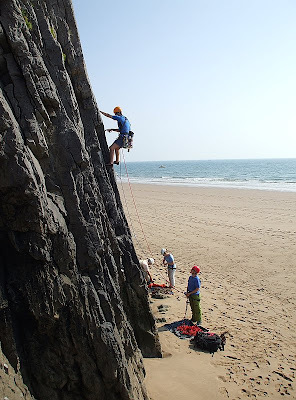 Introductions all round, grab the gear and it’s off to the (surprisingly hard to find) cliffs. Actually, the cliffs are not hard to find, just the bit where Dream is. This is itself surprising as both Graham and Dave had been here previously but seemed to have forgotten the topography. Much detouring and hill climbing followed before we eventually spotted some climbers. We followed them to the upper slopes and then made our way down to the little promontory where Ste and Jeff were rewarded with their first sight of the fabled route. Silly me. You will realise the significance of this mistake a little later. Time went on and sarnies were eaten. Eyes began to pick out features on the cliff. 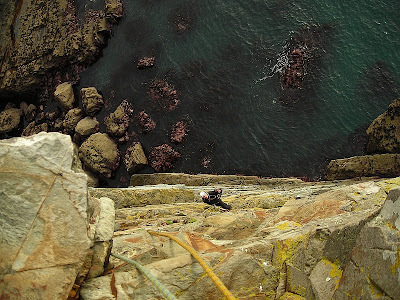 The Wen Crack and Ledge, Concrete Chimney, the first belay point after the abseil down, the great overhangs of the final pitch, fierce and forbidding and streaked with water. "We on then?" Oh yes. Geared up and at the abseil station Ste and Jeff checked and double checked everything before Ste set off down to build the first belay. The two climbers who had declared Dream to be too wet had already set off to do Wen and had thoughtfully left their ab rope in place. They also thoughtfully directed Ste to the Wen ledge as he was looking for the start of Dream thus neatly putting us in the wrong place. Hmm. So there we were, on this nice big comfy ledge with no sign at all of the “rising flake line" that we wanted to see. We were a few meters to the right of the Wen Crack and above us we could see a climber belaying. "I reckon if we go straight up here towards that climber we should find the flake line of Dream." It looked ok so I set off going slightly leftwards on what at first were very nice holds indeed. “This is fantastic Ste! Really nice climbing!" I enthused, making fairly rapid progress. 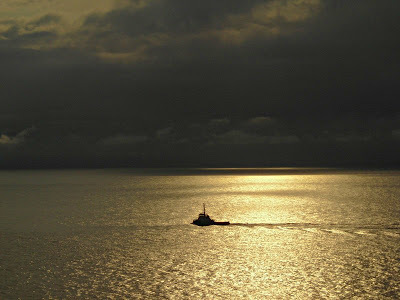 "Not much in the way of gear though," I murmured, as the holds started to thin out and become smaller and smaller, the straightforward though strenuous moves becoming more and more technical and the distance between the (rather poor) gear, getting further and further. 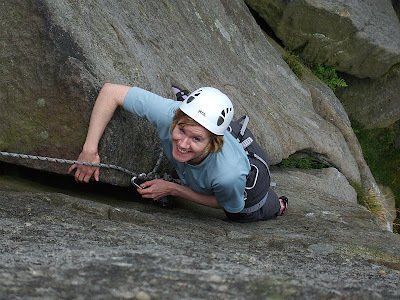 I was dimly aware at one stage, of a line of flakes going off to my left, but being a bit gripped was determined to reach what I still believed was the belay. I reached it eventually to find an extremely commodious spot (the niche) in which to build a bomber and even quite comfortable belay that was in entirely the wrong place from which to access our Dream of White Horses. It was in fact (of course) the start of the last pitch ON WEN. Damn. Ste came up, declaring the pitch to be harder than expected but glad of the two dodgy slings and three rubbish wires that I had found to protect the 30 odd meters of slightly desperate climbing. Are we having fun yet? Well yes actually, we were not too downhearted not to be on the correct route. We were, after all, in a fantastic position. Safely hanging in our little niche we had time to admire the view and contemplate what to do next. We soon worked out that getting back on Dream would require some very bold efforts indeed and in fact the deep and rugged crack line of the route we were on looked decidedly appealing. Ste's lead then and off he went. 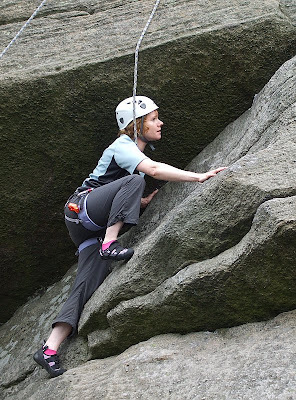 Dealing with the crack, pulling over the bulge and tackling the traverse with aplomb. Nice one dude. Really, really nice pitch. Can't wait to do the route proper. So, sigh of relief, grins all round, explain to Graham and Dave what we had been up to (they had been watching our efforts with some bemusement after finishing Britomartis), get the books out again and find out what we had been on between the ledge and the niche. Leave not your fate in the lap of the gods..........read your bloody guidebook properly! A Dream Of White Horses Part Two, FATE DETERMINED. August 26th and Ste and Jeff made their way gingerly along the narrow path to the abseil station. This was accompanied by much burping and letting off of wind from Ste who had been unable to finish his breakfast, blaming, "The powdered milk in my brew". Not, of course, the many pints consumed the night before in the campsite bar. Jeff too felt a bit wobbly tying on his prussik and launching, once again into the void to follow Ste to the (this time correct) belay point on Dream. Marvel dear reader if you will, at this pair's dedication in keeping the time honoured traditions of hard climbing. The preparation, the early nights, the crack of dawn starts, the healthy eating regimes, the fitness programmes...... All properly ignored in favour of a fish supper, lots of beer, a few hours kip and half a sausage roll for breakfast. We had read the guidebook properly this time though and spied out our belay. We were on. Invisible from a distance, the line of deep flakes was now obvious rising up and left, inviting lots of gear placements for Jeff as he lead the first pitch. Mostly straightforward with one or two quite technical moves providing extra interest on what is a fantastic line. Belay built in the crack of Wen, below the niche and Ste was away leading the second pitch. The flake line got steeper and ever higher, good climbing, plenty of gear again and on towards the block below the Concrete Chimney. What a place to be! No seals today(we had seen one the day before) but it felt great to be there. Blessed with decent weather, cool and a bit foggy for a short spell but nothing untoward, we positively revelled in our position. Last pitch then and stepping out over that great undercut drop was something else. Moving along, traversing, holds always where you wanted them to be. Even dripping wet in parts, this final pitch was a joy. Great teamwork too, runners extended, rope given or taken in promptly and without drama, time to look down and thoroughly enjoy the exposure and grin at each other. Bloody marvellous. Under the final overhanging block then, belay from there to avoid dragging the rope tight around the corner. Much nicer too, to be able to see something of your partner as he comes across and watch him smile as he sees the sky above your heads. A Dream of White Horses HVS 5a, 4c, 4c. This time, fate determined for ourselves.